Summer Kids Kamp and Fall PreSchool Sessions Filling Up Quickly! Christ Lutheran PreSchool is offering items from Yankee Candle as an easy-to-order fundraiser. Yes, there are candles, but also holiday decorations, kitchen items, gifts and more. Paper orders have concluded you can still order online – and items arrive super quickly. Online Directions: visit yankeecandlefundraising.com, scroll down the page to “Start Shopping,” and use our Group Number 999972597. Thank you for your generosity. Each month we will gather for a brief chapel service where we sing songs, review lessons and celebrate birthdays (and half-birthdays). Parents, grandparents, siblings, care givers – everyone is invited to join us for the service, which starts at 11 a.m. Please join us! To adapt to the changing needs of our families, we offer before/after care not only for our current PreSchool students, but also for for Kindergarten students. Parents are responsible for transportation, though Hawthorn students may be able to arrange for bus transportation with the Hawthorn District Office. Students will join in our multi-age preschool class. Activities include arts and crafts, board games, puzzles and outdoor play when weather permits. Extended Day is available from 7:30 to 8:30 a.m. and again starting at 2:30 p.m. More information is available on the info sheet – CLCKindergartenExtended2017. Christ Lutheran Preschool will provide a Christian based curriculum for preschool children as part of their first experience with formal education. Christ Lutheran Preschool shall serve as the premier early childhood education center in Lake County for whole child development. Guide each child in developing mentally, physically, socially, emotionally and spiritually while having fun. Create an atmosphere in which the child can explore and satisfy curiosity about the world through hands-on learning. Help each child pursue individual interests and develop individual abilities with love, guidance and encouragement. Introduce learning concepts for a strong beginning in school fundamentals as licensed by the Illinois State Board of Education. Encourage an enthusiasm for continuous learning in each child, using an innovative curriculum. Teach each child that God loves us all. Our philosophy recognizes each child as a unique individual creation of God. Our developmentally appropriate preschool curriculum gives the children the opportunity to grow at their own pace, emotionally, intellectually, socially, spiritually and physically. Our success is a combination of the highest quality programming as well as experienced, educated teachers. 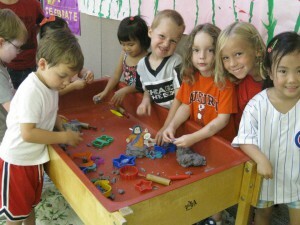 A warm and loving learning environment is created to provide an energetic and fun preschool experience. Our program is designed to help make a smooth and successful transition from home to school by providing a safe and comfortable environment. We create opportunities for peer interaction and contact with knowledgeable and caring Christian teachers. Our positive school atmosphere helps children develop self-confidence and allows their attitudes, skills and curiosity to expand. We encourage responsible behavior in our children, especially group cooperation and concern for others. Our objectives are to stimulate young children to love learning and to grow through positive encouragement. Christ Lutheran Preschool is self-supporting with private tuition payments. The Christ Lutheran Preschool staff is committed to conducting its programs and activities in the safest manner possible. The welfare of your child is our utmost concern. We insist that all children follow rules and guidelines that have been designed with the student’s wellbeing in mind. Christ Lutheran Preschool does not carry medical accident insurance for injuries sustained in its program. The cost would make our fees prohibitive. Parents should review their own health insurance policy for coverage of any injuries sustained or arising out of activities in this program.